Delicious for a side salad or as a good chips ‘n’ dip! 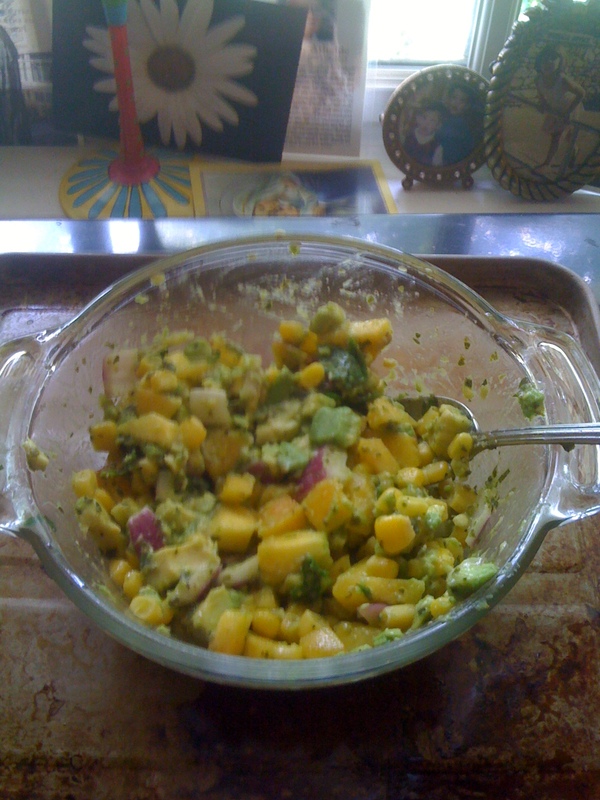 YUMMO inspired by cookie+kate’s Avocado Peach Salsa, I decided to try the sweet salsa road. I’m a total sucker for that Peach Mango salsa from the grocery store, but I’ve never tried to make a sweet and salty salsa. Having all that leftover chimichurri sauce, I needed to use it on something good. Even though the chimichurri has ginger in it, the cilantro lime cumin part of it is great for a salsa sauce. I added 1 chopped peach, about 2 tbs of my chimichurri, half a can of drained corn, an avocado chopped up, some red onion, extra limejuice, fresh cracked sea salt (this is key), a tiny dash of sugar (the peaches were a bit tart) and yum, fresh salsa!